This patch allows you to play through the prologue of Shadow Dragon on higher difficulties. Enemies will scale up to your difficulty of choice for the prologue's duration. This also allows you to choose the sacrifice and (potentially) obtain Norne on higher difficulties. Changes have been made to Prologue 1 and 2 to help accommodate higher difficulties, such as placing a vulnerary in Marth's inventory, having certain enemies drop vulneraries, and changing the class and equipment of certain enemy units. Script edits have also been made to make the intro cinematic always load the normal difficulty version - the one that ends with, "Thus Marth applied himself to the ways of the pen and sword, until one day..." instead of summarizing the prologue - even when you pick hard modes. Text editing has also been used to make the help text say that you get the prologue on all difficulties, rather than hard modes still saying that no prologue is included. The Gaiden Requirements Removal Patch, made by Robert of Normandy a.k.a. RobertTheSable, has been incorporated into this patch. If you want to use the Gaiden Requirements Removal with this patch, use FE11HardPrologueWithGaiden.xelda. 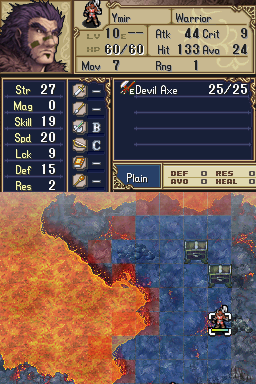 If you want the regular game with no changes other than being able to play through the prologue on higher difficulties, use FE11HardModePrologue.xdelta. USE ONLY ONE VERSION OF THE PATCH, NOT BOTH. This patch also fixes the long-standing Ymir movement bug associated with the Gaiden Requirements Removal Patch. As part of the fix, Ymir will now actively move during Chapter 20x (instead of being stationary, as he is in the unmodded game), and his dialogue has been slightly altered to reflect this. 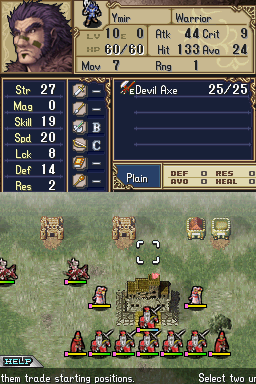 This was made using the US version of FE11, so you should use an .nds file from that region. Please note you'll have to acquire a copy of the FE11 .nds legally; only the patch is included in the download. 2. Extract DeltaPatcherLite.exe, your unmodified .nds file of FE11, and EITHER FE11HardPrologueWithGaiden.xdelta OR FE11HardModePrologue.xdelta to the same folder. DO NOT USE BOTH .xdelta FILES; CHOOSE ONLY ONE. The difference is explained above. 4. Click the "Open" button for the "Original file" box and select the unmodified .nds file of FE11. 5. Click the "Open" button for the "XDelta patch" box and select EITHER FE11HardPrologueWithGaiden.xdelta OR FE11HardModePrologue.xdelta. 6. Click the "Apply Patch" button. Users with older PCs may have to wait a few moments. 7. Your previously unmodified file, which you selected in step 3 as the "Original file", is the patched ROM you should now use. (Optional) To confirm that the patch applied correctly, double-check that the checksum, MD5, and SHA-1 values match up with the ones listed on the below RH.net page. If you don't know what those are, use a utility like this one to see what your patched ROM's values are. If they're different, you probably used an .nds file from the wrong region - you need to use a US ROM. Since you're hacking this game, could I make a minor (or not) request; replacing the portraits for Marth and Caeda with the versions from New Mystery? I really hate the way Marth And Caeda look in Shadow Dragon. Okay, being serious about this: You're a godsend for this. I've always wanted to play prologue with H5, and now my dream is realized, plus it auto triggers gaiden chapters! Yay! This is exactly what I was waiting for to play Shadow Dragon seriously! Now I can finally play two of my favourites on Hard and above, so thanks. Btw, now that I think about it... now that this is out, should tier lists be adjusted so that Frey and Norne are judged based on how they perform in H1-5 as well? It could be bad news for Norne, but great for Frey (the dude is quite Amazing, even more than Cain and Abel IIRC). I've been waiting for this to happen for a long time. Finally, I can use Frey in hard mode! Thank you very much. I shave with a chainsaw. Thanks for this. I've always enjoyed the prologue and how it added to Marth's character but hated how it was NM exclusive and made the rest of the game piss easy. Also, hanks for the Gaiden patch. I was never able to get that to work, so hopefully it will now, though, has the Ymir movement bug been fixed? has the Ymir movement bug been fixed? I'm looking into ways of fixing that, but I don't have a save file from chapter 20 that I can use to test potential fixes (any fixes will have to be loaded during the chapter transition, so that's why it needs to be from 20 rather than 20x). That's why I put a request for one in the OP. It's pretty late in the game, and playing up to there myself would be too time-consuming. The sooner I get a save file from chapter 20, the sooner I can see about fixing that long-standing bug. Oh I see. I'll see if I have time eventually, maybe at the weekend and I'll try marathon to chapter 20. I'll make sure to get back to you. The patch now fixes the long-standing Ymir movement bug associated with the Gaiden Requirements Removal Patch. As part of the fix, Ymir will now actively move during Chapter 20x, and his dialogue has been slightly edited to reflect this. Re-download the patch from the link in the OP to update; old saves should be compatible if you export and import backup memory. Thanks to Nuthingdude on the FE subreddit discord, who provided me a save file at Chapter 20 for use in bugtesting. I've also submitted the mod to RH.net, but they take forever and a day to approve new submissions, so it'll remain on Mega for the time being. Also, I will release a stand-alone update for the Gaiden Requirements Removal Patch later in the week for those who want the Ymir bug fixed but aren't interested in using this mod as well. Finally a Shadow dragon hack thats really good. Gaiden removal wasnt really useful but I really like the prologue so. Thanks. Ymir's stats have been altered. Now, he's a powerhouse with amazing stats all around who could've easily taken on Camus if he joined a chapter earlier. I quickly warpskipped the chapter to see if he kept those hilarious stats once recruited. Rest assured, he did. None of the other gaiden characters (except for Nagi, I don't know about her, since I haven't played 24x yet) have this issue. I can understand the changes to the prologue (which baffled me at first, too, but then I read this thread more carefully and noticed they were intended and perfectly justified), but this? I can only assume this is a bug, because despite the fact that he now moves from his starting position, Ymir is in no more danger of dying than before, as he's still a red unit (if anything, now my army are the ones in more danger of getting killed by this monster of a unit! ), so there's no real reason to increase his stats, and there's no mention of Ymir being buffed in the OP, even though you mentioned a detail as trivial as the fact that a line of text was edited to reflect Ymir not being stationary. Just thought I'd report this, in case it's a bug that managed to slip by. If not, does anyone have any ideas of what might be causing this? If nothing can be done, I guess I'll just make do with benching Ymir, I'd feel bad if I used him in this state. Other than that, it's a great patch that gave me the motivation to finally get around to playing through Shadow Dragon. Frey became my MVP, to the point where he one-rounded Camus with a ridersbane! Oh, hell. Yeah, that's a bug, and I know exactly why it's happening - I must've erroneously set a flag for his stats to scale up when I was changing his AI. Give me some time and I'll fix it. Thanks for the quick response! If you could fix it in time for me to continue my run normally, I'd really appreciate it. This should be backwards-compatible with old saves - if you're using Desmume, use options to import and export backup memory. Starting with this version, DeltaPatcherLite is directly packaged in the archive too. The link in the OP has also been updated, so you can use the link in this post or the one in the OP, whichever. Excellent. Thank you very much for fixing the issue so quickly. If I catch sight of any other strange occurrences, I'll be sure to tell you.